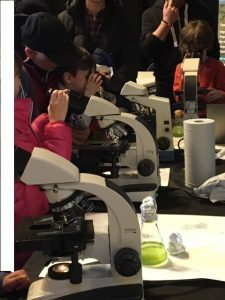 Family Science Festival success to celebrate National Science Week 2019! 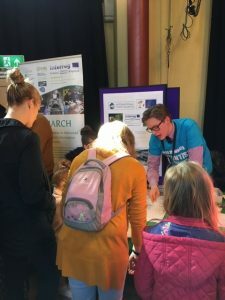 To celebrate the National Science Week we organised a Family Science Festival in Dorchester’s Corn Exchange (17th March 2019). 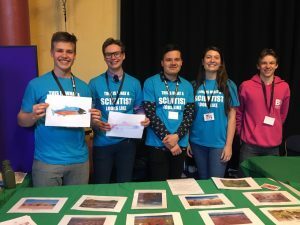 The Festival was an incredible success, with more than 2,200 visitors exploring the science presentations and workshops organised by Bournemouth University in partnership with Dorset County Museum, Dorchester Town Council and the Thomas Hardye School. Our ambition is to make this festival an annual event, and rename it Dorchester Science Festival, which would run over a whole week-end. Many BU undergraduate and postgraduate students and staff were involved in the activities offered to the general public. Genoveva Esteban (co-organiser and master minder of the event), Dan Franklin, Matthew Bennet, Sally Reynolds, Adrian Newton, Marcin and Dominika Budka, and Stephen Watson’s hands-on activities were all enthusiastically received by children and adults. The atmosphere was captured on film by BU’s award-winning media production agency Red Balloon. The event was sponsored by EU-Interreg project SAMARCH, the Royal Society of Biology, Dorchester Town Council and BU. We are also grateful to the ScienceIRL Project developed by the Indian River Lagoon Science Festival SAMA (Florida, USA) for sharing the “This is what a scientist looks like” T-shirt idea with us.